I discovered Thistle Farms last year thanks to Marie Forleo’s #GivingTuesday newsletter. It was one of the charities on her list, and it immediately caught my attention because they focus on women survivors of trafficking, drug abuse, and prostitution and because they believe that only love can heal. I always believed that we should find ways to help women who are in the streets, to offer alternatives instead of judging them and feel righteous. First, if you are not in the same situation, it is most likely because you were lucky enough to be born into more favorable conditions and given opportunities that you may consider reasonable. I remember when I was studying gender studies at University, one of the teachers said that it’s hard to talk about equality with an entitled white man; instead, we should ask an African-American lesbian coming from the underprivileged background. That was twenty years ago, and things changed a lot. Young men are much more aware and conscious of gender, equality, and the environment now. I chose to introduce you to Thistle farms because we should all realize how grateful we are if we have a safe house, if we are healthy, have a regular income and live in a free country. Now, talking about a free country, I mean a country where we can freely express ourselves (not having the freedom to buy stuff that we don’t need). 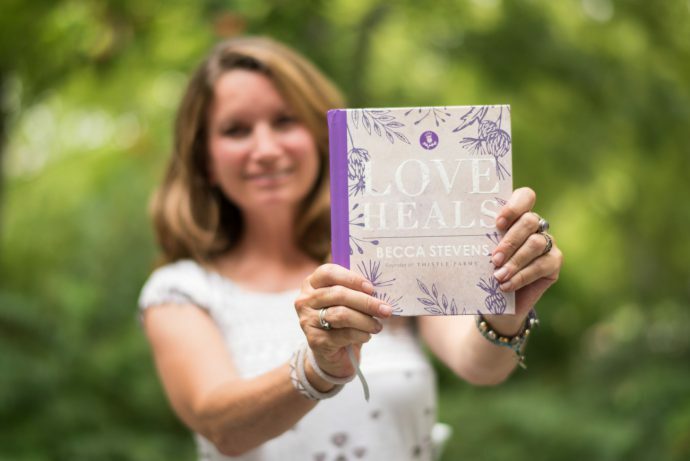 Enjoy the interview with Becca Stevens, founder of Thistle Farms, and I leave a comment below what you think. Why did you create Thistle Farms? I began in 1997 when I realized that women on the streets had few, if any, options for long-term, safe housing to recover from the trauma and abuse they had experienced. We started with one home for five women survivors of prostitution, trafficking and addiction under the name Magdalene. But as the women began to heal and flourish, felonies on their records made it difficult to find a job. In 2001, I started a cottage business, under the name Thistle Farms, making natural candles and body balms to provide women income. 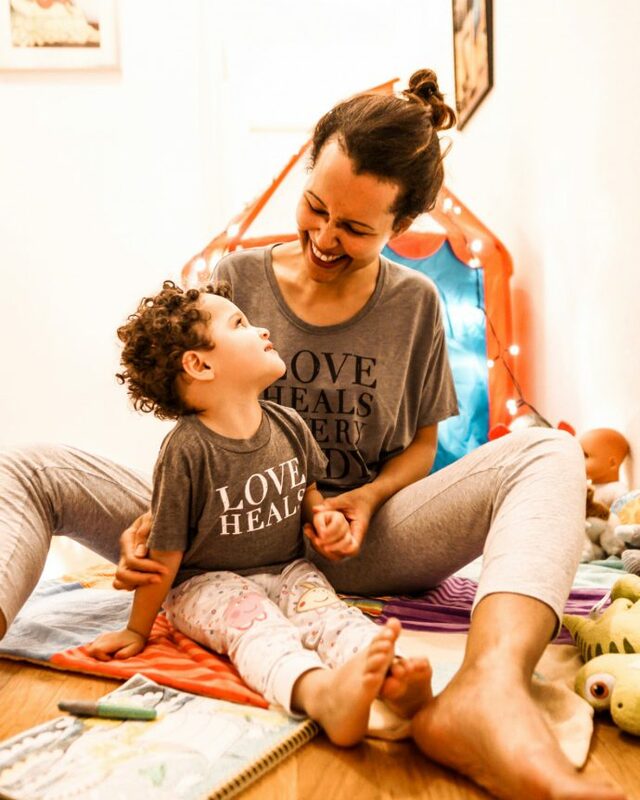 Our mission statement, our guiding principles, and the belief that love is the strongest force for change in the world, were really formed in the early days. What is your model of recovery? 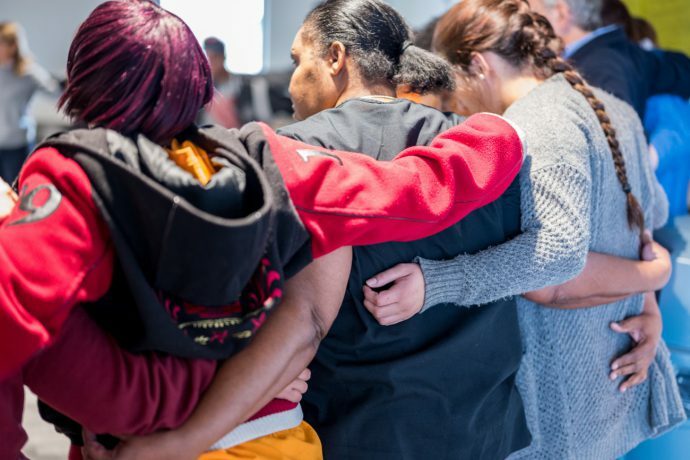 What makes Thistle Farms different from other organizations that offer help women that survived human trafficking, prostitution and/or drug abuse? When women come to Thistle Farms they’re basically committing the next two years of their life to finding their way back home. They spend the first six months working on their body and mind—working on addiction, post-traumatic stress, medical and dental needs, restitution with their children through the courts—any number of things. After that, they come to work at one of our social enterprises. Many of the women don’t have any work experience so we try to offer a trauma-informed environment where they can earn money and build skills. The second year in the community is all about preparing women to live on their own. 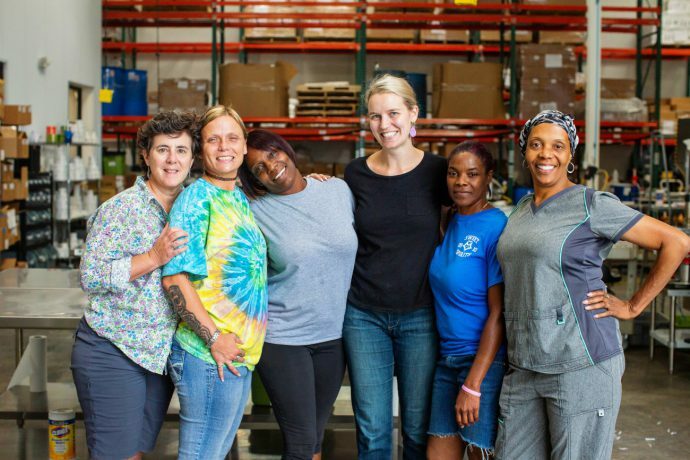 We have a plan that will match their savings, we have life skills classes, they can go to college…and if they want to stay on at Thistle Farms they can train to take on more of a management position. There are all kinds of options and they mean that the women never have to go back to the streets.They can get a car, a place to live, they can have their own bank account, and make decisions about what they wear and how they spend their time. These things make a radical difference. Love is the strongest force for change in the world. Do you believe that unconditional love, acceptance, and understanding can help to heal women survivors? I believe love heals because I have seen it. I have seen it through 20 years of working with women who are survivors of trafficking, prostitution, and addiction. I have watched women who were considered “throw aways” by court systems, families, and communities become healthy and strong women. I have seen love heal in my own life as well. As I have tried to practice simple daily rituals of healing, I have watched my own anger turn to advocacy, my own brokenness turn into compassion, and my own anxiety turn to grounded strength. What motivates you to continue doing your work? How do you relax? Gratitude, and also laughter. One of the things that people may not realize is that we laugh as much as we weep and work. That laughter is healing. It keeps us close as a community and helps us through our harder days. There is not a day at Thistle Farms where someone doesn’t bring joy into my life. I relax by hiking, practicing yoga, and spending time with my family. Why did you create your 2-year residential programme? Having a long-term, free, safe home is one of the greatest gifts you can give someone coming out of violence and abuse. Finding some peace while working on trauma is critical for survivors. The notion of home calls out to everyone. Many of the women talking about receiving a key to their Thistle Farms home as the biggest gift of their lives. Medical/dental therapy and trauma therapy are also essential, as well as a loving, non-judgemental community to walk with her throughout this process. Revenue earned from the Thistle Farms Body & Home line as well as our Café goes directly back into the organization and now provides the largest percentage of our funding. Last year this resulted in survivors earning 2 million dollars in income through Thistle Farms! The remaining funding is from donations from generous individuals and organizations who believe in this work. These tees are so adorable! What a fantastic way to help others and in return they will contribute to the community. This was such a wonderful and uplifting story. Love this cute tees! What an amazing cause. Thank you for shining a light on it. Oh this is so amazing!!!! LOVE! This is amazing. 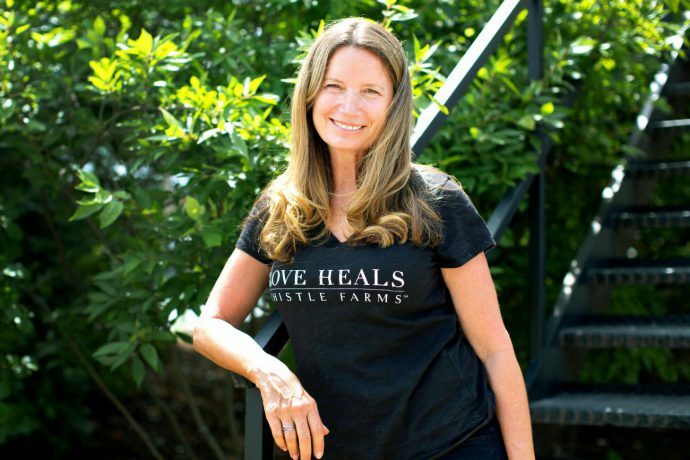 I wish there were more places like Thistle Farms to help women who have gone through so much.